Despite representing just over 4 percent of the global population, the United States is responsible for nearly a quarter of the global prison population. This is a human rights issue of epic proportions that urgently needs to be addressed, and done so with the expertise of those most impacted. The O.G. Experience, inspired by HBO Films’ O.G., uplifted the voices and experiences of those who have been the most impacted by incarceration and uncovered important truths about the United States’ history of oppression. Just as the original film cast currently incarcerated people in a real correctional facility, The O.G. Experience showcased the work of formerly incarcerated artists, picking up where the film left off while providing a uniquely honest and evocative insider narrative about the U.S. prison system. Built with the intention of sparking a conversation about the staggering effects incarceration has on our communities (both inside and outside the penal system), the O.G. Experience raises critical questions that will lead us to actionable solutions. Lastly, all of this would not have been possible without the Right of Return USA Fellowship and its co-chairs Jesse Krimes and Russell Craig. Now in its second year, The Right of Return USA Fellowship is the first — and only — fellowship exclusively dedicated to formerly incarcerated artists. Eighteen x 18 Holds the Inaugural #WeVoteNext Summit! On the morning of November 9, 2016, it became apparent that the 2018 Midterm Elections were going to play an outsized role in the future of this country. Nearly every critical issue facing future generations would be affected by the decisions made at the polls in 2018, and it was never more imperative for young voters to get involved. 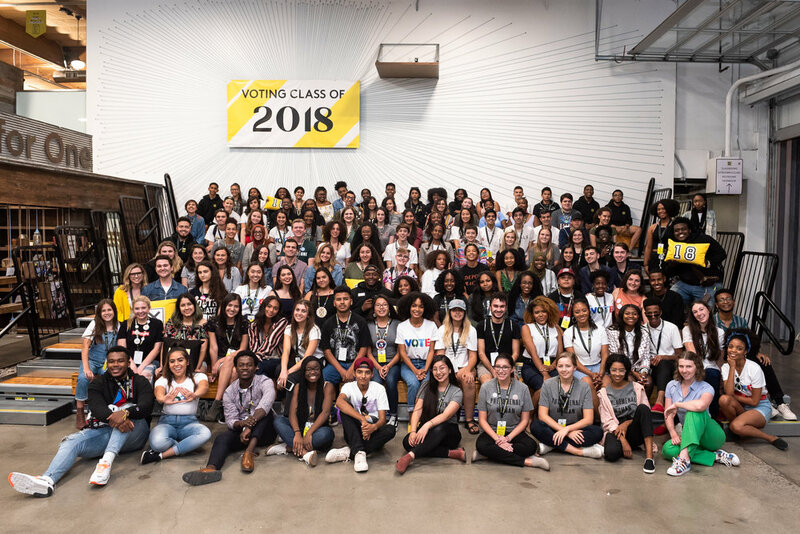 And that’s why Yara Shahidi founded Eighteen x 18 — to educate, engage and help activate the youngest generation of voters. 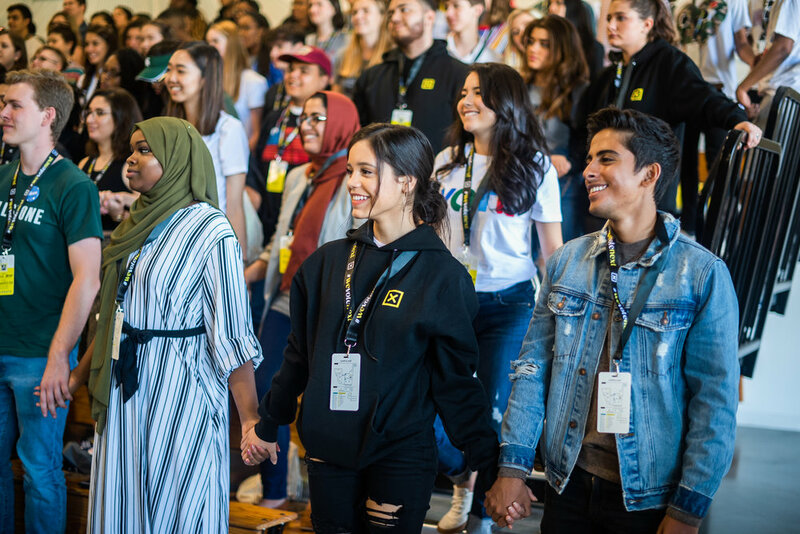 Held at the TOMS Shoes headquarters in Los Angeles, we were thrilled to host 129 young people from all 50 states and Washington, D.C. for a day of collaboration and celebration. During the summit, delegates dove deep into the issues that are most important to them, discussed how our elected officials should address those issues and traded ideas about the things they could do to make the biggest impact at home. 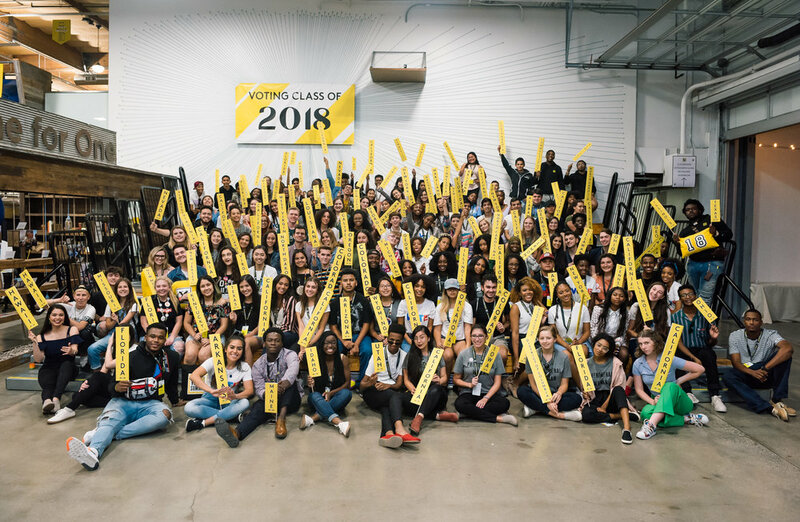 The #WeVoteNext Summit excited and inspired our delegates ahead of the 2018 Midterm Elections, and equipped these young leaders with the tools and resources to get out the vote in their communities. Delegates created innovative campaigns that they took back to their communities to turn out the youth vote. Guest speakers included actresses Laverne Cox and Rosario Dawson, Black Lives Matter leader Janaya “Future” Khan, former EPA Chief Justice Official Mustafa Ali and Phenomenal Women Action Campaign founder, Meena Harris. Perhaps most importantly, however, was that the #WeVoteNext Summit delegates created a new network of their own, leveraging their experiences and resources to continue the work that began at the summit. And finally, we couldn’t have produced this event without our partners, so many thanks to TOMS shoes, PopSockets, Tory Burch, the Filmmaker Fund and NowThis News. The Museum of Broken Windows is a pop-up experience in New York City that features the work of artists from around the country. The Museum showcases the ineffectiveness of broken windows policing, which criminalizes our most vulnerable communities. The strategy of broken windows policing is outdated and has never been proven to be effective at reducing crime. For decades, communities of color have been disproportionately impacted by broken windows policing. The Museum of Broken Windows demonstrated the need for change and New Yorkers came together for important conversations on policing and safety. Using art and creativity, the Museum of Broken Windows provided a powerful and emotional experience that critically examined the system of policing in New York. The Museum of Broken Windows was a project of the New York Civil Liberties Union. The Museum was a retrospective exhibition of broken windows policing in New York. We began our journey in 1968, a significant year in the exhibit. The Museum escorted guests through the various decades, by utilizing subway turnstiles and artwork that focused on policing in the subways. There were powerful pieces that represented the important events of the 1990s, including front page covers of Abner Louima and Amadou Diallo from The New York Daily News and a commissioned piece that highlighted the 1999 “Rap Intelligence Unit” or Hip-Hop Police. Moving into the 2000s, we included pieces on “stop-and-frisk,” Eric Garner and a powerful image of Mayor de Blasio at an NYPD graduation. The next section of the Museum spoke the impact of broken windows tactics on a national and international scale. The Writing on the Wall, a collaborative piece by artist Hank Willis Thomas and educator Dr. Baz Dreisinger, lined an entire corner of the Museum and displayed hundreds of unique illustrations and letters from people who are incarcerated in the U.S. and abroad. Another important piece in this section was ...and counting. Created by artist Ann Lewis, this large scale installation was composed of 1,093 toe tags that hung under an illuminating skylight. Each toe tag featured the name of a person killed by the police in 2016. 13 toe tags featured the names of individuals who were killed by the NYPD. The Museum of Drug Policy is a pop-up arts and cultural hub that highlights how drug policies impact and shape our communities. Through live programming and art, the Museum provides a powerful experience that illustrates the harmful consequences of current prohibitionist drug policies and advocates for new approaches rooted in dignity, health, and human rights. This free event transports audiences across the globe and pushes visitors to think and act outside the box. The Museum of Drug Policy is supported by the Open Society Foundations and was first launched in New York City in April 2016. We aimed to create an experience that opened people’s hearts. The art in the exhibit powerfully challenged people to think more compassionately about drug policies and drug use. The pieces not only showed the harmful consequences of current drug policies, but also brought light into the darkness; they reimagined approaches to drug policy that are centered in public health and human rights. The artists protected the dignity of the many forgotten victims who lived and died as a consequence of the war on drugs. We learned that art and culture are critical weapons in the debate regarding drug policy. This exhibit started with a jolt of energy. An eighteen foot long, seven foot high, one thousand pound sculpture by Mexican artist Eduardo Oblés had a dominant presence that evoked a visceral reaction, much like the war on drugs. There were several large-scale pieces, each demonstrating a complicated struggle of power. The powerful symbols, however, were in spaces that featured zero artwork. Throughout the Museum, there were several empty spaces to represent the victims of the war on drugs. The exhibit had an international scope, from artwork created by Philadelphia-based artist Jesse Krimes on federal prison bed sheets to watercolor portraits of those who were executed in different regions of the world for being accused of various drug crimes. The Museum of Drug Policy in Mexico City was created in collaboration with local artists, whose work addressed the harmful effects of the war on drugs, and highlighted the positive harm reduction initiatives in Mexico such as: community-based services, needle exchange programs, and indigenous rights. The show ended with an invitation to reimagine more just and compassionate policies. The exhibit coincided with the Open Society Justice Initiative conference held at Universidad del Claustro de Sor Juana. The conference focused on the need for an internationalized mechanism to address the continued failures of the Mexican justice system to prosecute grave crimes and corruption. At The Soze Agency we honor the authenticity of the individuals who work with us. We acknowledge and celebrate all of the skills, abilities, experiences and identities Soze employees hold and the remarkable impact they have on our work. We also understand that our skills and abilities shine best when placed in a structure that cultivates personal development, communication and overall transparency within our company. In an effort to create a more equitable structure, we have decided to replace our boring job titles with descriptions that truly define what we do at The Soze Agency. At Soze, we aim to create a management system in which authority and decision-making are equally distributed to teams and roles rather than through some old school corporate hierarchy. We aim to build a company grounded in collective accountability and radical transparency, with the intention of delivering high-quality, impactful work. We believe that this new structure will cultivate an equitable experience for Soze employees, partners and clients alike. So, what does this look like at Soze? Moving forward, every full-time employee at The Soze Agency will enter our company as an Associate Partner and transition to Partner after one-year. We intentionally use "partner" because we come with many skills, experiences, and expertise that don't necessarily fit under a traditional job title. Nahid Ebrahimi is a partner at The Soze Agency with a speciality in digital media strategy. While most of her work is spent as the social media manager for one of our clients, Nahid also has a skill set in civic engagement. Occasionally, she leads on strategic planning for our artist/activist retreats. Nahid is multi-dimensional with many skills that lend itself to the entire mission of our company. As a worker-owned cooperative, our focus is on the health, well-being and dignity of the worker. As we make this shift, we are excited to invite our clients and partners into our culture as we continue to strive towards a more equitable society.